We’re back with part two of our Hairdresser Gift Guide! Christmas is less than a month away, which means it’s time to get all that shopping done! 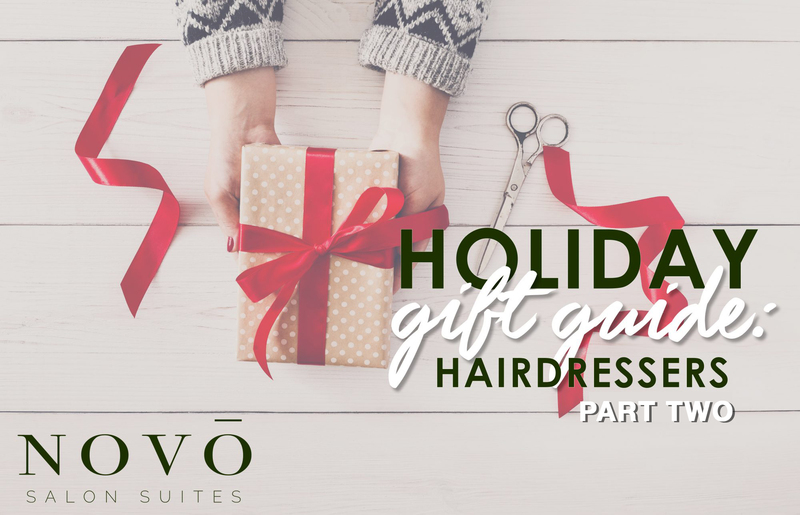 In part one of our gift guide, we mentioned three different gifts to give your hairdresser this season- an extra tip, a scented candle and a picture frame or wall decor. We’ve got three more for you today! When you get your hair done, you might notice specific products that your hairdresser typically uses. Grabbing a big bottle of her favorite shampoo or texturizing spray is a great way to show your appreciation, as well as contribute to her stockpile of products. A hairdresser can never have too many products on-hand! A quick and easy gift idea is a gift card! Find out her favorite store or restaurant and write a little note telling her how much you appreciate what she does for you! It’s a nice gesture that will surely go a long way! From ornaments to necklaces, there are many gift shops and online retailers that offer customized gifts. A necklace with a cutting shear pendant or a Christmas ornament that says “Best Hairdresser Ever” is a sweet way to show how much you care! Putting effort into buying (or making) gifts for someone is the most important part of gifting. Getting them something that is meaningful shows that you truly know them and that you appreciate their friendship.